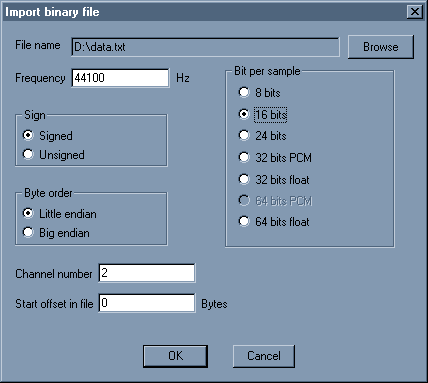 You can import any file, choose the settings for samplerate, bitdepth, sign, channel number and byte order. You can also select an offset to skip the first n bytes of the file. You need the lame_enc.dll to be present in the Wavosaur folder (or system folder). This feature exports all the data regions delimited by markers in separated files. Go to menu Files -> Export -> Export as text This feature exports the current files in text format, for using in application such as Excel, Matlab, PSpice etc. It's not recommended to export long files as text!